Milt Lee (Cheyenne River Sioux), talks about his film Video Letters from Prison. In the film, Lee follows three young Lakota girls from the Pine Ridge Reservation as they establish communication with their incarcerated father. Ben Kreimer speaks with Casper Lomayesva (Hopi, Diné) about his musical career. Lomayesva is a reggae musician from the Hopi Nation in Arizona. His music contains social and political themes that blend elements of traditional reggae and Hopi culture. Ben Kreimer speaks with Joy Harjo (Mvskoke) about her musical career and many other talents. In 2009, Harjo won the Native American Music Award for Best Female Artist of the year for her album Winding Through the Milky Way. A saxophone player, Harjo performs solo, as a duo and with her group The Arrow Dynamics band. Luke Griswold-Tergis met Cory Mann (Tlinget) while hitchhiking through Alaska—on a sailboat. “Luke and I became friends mainly because he was sleeping on my floor,” explains Mann. During his time spent in Alaska, Griswold-Tergis was struck by the recollection of Alaskan Native peoples’ history and traditions, but realized that the knowledge “is endangered, and people need to work on preserving it more.” As co-producers of the film Smokin’ Fish, Griswold-Tergis and Mann explore the Tlinget tradition of smoking fish from the perspective of Mann. Reporter Ben Kreimer speaks with filmmakers Mary Hager and Arlie Neskahi about their work on the film For the Generations: Native Story and Performance. The new documentary, For the Generations: Native Story & Performance, offers viewers a unique look at today’s most progressive Native American music and dance performers. The film is a joint production of Mary Hager (French-Canadian Cree/Metis) and Arlie Neskahi (Navajo) of Painted Sky, and Sean Hutchinson of Oregon Public Broadcasting. This month’s Producer Profile features Hager and Neskahi of Painted Sky, an organization dedicated to building public awareness of Native American culture, music and dance through performance and education. For the Generations features performers from around North America, chosen for their unique and progressive attitudes toward Native American music and dance in the 21st century. The film For the Generations: Native Story and Performance is a collaborative effort between Painted Sky and Oregon Public Broadcasting. Reporter Ben Kreimer spoke with the co-producer Sean Hutchinson, about his work on For the Generations. The film offers viewers a unique look at today's most progressive Native American music and dance performers. Listen to our exclusive interview with Buffy Sainte-Marie (Cree). Buffy is an icon with Native media and music. In 1975, she joined Sesame Street for five years. Buffy's first release was in 1964 and since then, she has been recognized for her music and many accomplishments. She recieved a Golden Globe and an Academy Award for "Up Where We Belong." AIROS talked with Buffy about her career and her great accomplishments. 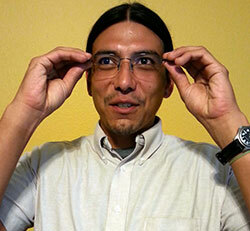 Sterlin Harjo (Seminole/Creek) is the director of the award-winning film Barking Water. The film is about Frankie and Irene, an older couple with on-and-off relationship of 40 years. With Frankie in the hospital suffering from a terminal illness, Irene comes back to him one last time to take him home to see his family. In this month's Producer Profile, Harjo talks about Barking Water and his film career. The new Emmy-nominated men’s health documentary Walking into the Unknown tells the story of Dr. Vainio, as he undergoes a series of medical examinations that will change his life, and the lives of those around him. Directed by Nate Maydole and produced by Ivy Vainio (Grand Portage Band of Ojibwe), Walking into the Unknown takes the viewer into the doctor’s office as Dr. Vainio undergoes health screenings recommended for all men approaching their fiftieth birthday. Reporter Ben Kreimer speaks with Dr. Arne Vainio about his central role in the new Emmy-nominated American Indian health documentary Walking into the Unknown. Dr. Vainio is an Ojibwe physician on the Fond du Lac Reservation in northern Minnesota. In the film, Dr. Vainio, who is approaching the age of fifty, undergoes a series of medical examinations to determine his risk for health conditions such as diabetes, colon cancer and other health problems that have a tendency to appear during midlife. Be sure to check out the AIROS Producer Profile featuring Ivy Vainio and Nate Maydole, the producer and director of the film, available here. Production assistant Tobias Grant speaks with Robert Mirabal (Taos Pueblo) from northern New Mexico. He has won two grammys. He is a featured artist on the documentary For the Generations: Native Story and Performance. NAPT Assistant Director Georgianna Lee and Production Assistant Ben Kreimer speak with Martha Schultz, her daughter Lola Cody and granddaughter Melissa Cody, representing three generations of Navajo weavers. Society of America's 12th Biennial Symposium in Lincoln. Three Navajo weavers from Arizona were invited to demonstrate the weaving process for exhibition visitors. Martha Schultz, her daughter Lola Cody and granddaughter Melissa Cody, representing three generations of one weaving family, setup their equipment outside the Cooper Gallery and demonstrated for visitors how raw wool is carded, then spun, and subsequently woven. NAPT Assistant Director Georgiana Lee and Production Assistant Ben Kreimer interviewed the three weavers following their demonstration. Production assistant Tobias Grant speaks with Bill Miller, Stockbridge-Munsee Mohican, about his music as well as performing a symphonic piece about the battle of Little Bighorn and an experience on the red carpet at the Grammys. He is a featured artist on the documentary For the Generations: Native Story and Performance. Ben Kreimer speaks with Michelle Danforth (Oneida) about her most recent film Sacred Stick. The film explains the origins and spirituality of Lacrosse within Native American cultures, as well as stories from early European contact and adoption of the game. Intertwined with the historical aspect of the film is game footage of the Iroquois Nationals--the modern all Native professional Lacrosse team representing the Six Nations of the Iroquois League--playing at the world level. Ben Kreimer speaks with Kate Montgomery about her film, Christmas in the Clouds. The film, written and directed by Kate Montgomery, is a Native American comedy of errors that humorously defies Native stereotypes on the big screen. Set at a plush Tribal owned and operated ski lodge, Christmas in the Clouds combines multiple cases of mistaken identity and a cast of quirky characters that flies "in the face of stereotypes about Native American people," says Montgomery. NAPT Project Coordinator Brendan McCauley speaks with Gary Farmer, Cayuga, from Canada. Farmer has been a television and film actor since the 80s. He plays the father of the main character in Chris Eyre's Smoke Signals and is also one of the co-stars of Dead Man. He helped create Aboriginal Voices Radio in Canada. NAPT Project Assistant Tobias Grant speaks with Joey Stylez, Cree Metis, from Canada. Joey Stylez is a Canadian hip hop artist from Moosomin, Canada. He and his friends started their own record label and clothing company. He won 2009 best video and the 2010 best pop cd and songwriter of the year from the Aboriginal Peoples Choice Awards. Louie Gonnie is Dineh from the Navajo Nation in New Mexico. Due to Louie's admiration for his father and uncles, he decided to sing in the Native American Church so that he could be just like them. Gonnie is a well-rounded artist with ties to music, art and writing. After singing for the church and family and friends, he noticed that people were recording his music, realizing that a career as a recording artist was within his grasp. Ben Kreimer speaks with actress Diane E. Benson (Tlingit) about her role as Tlingit activist Elizabeth Peratrovich in the film, For the Rights of All: Ending Jim Crow in Alaska. The film tells the story of Alaska Natives and the injustice they experienced after the United States purchased the Alaska Territory from Russia. Facing racism, segregation and discrimination, Alaska Natives staged their own civil rights movement. Peratrovich's impassioned testimony before the Alaska Territorial Senate helped Alaska Natives achieve the legal recognition they desired. Ben Kreimer speaks with Diane E. Benson and Jonathon Stanton, about their films incorporating Alaska Natives and their efforts to overcome harsh Alaskan environmental and racial obstacles. In the first interview, Ben Kreimer spoke with actress Diane E. Benson (Tlingit) about her portrayal of Alaska Civil Rights leader Elizabeth Peratrovich, in the Jeffry Silverman documentary, For the Rights of All: Ending Jim Crow in Alaska. The film tells the story of Alaska Natives and the injustice they experienced from the United States government. In the second producer profile, Kreimer spoke with filmmaker and adventure athlete Jonathon Stanton about his new documentary, Games of the North: Playing for Survival. Games of the North: Playing for Survival, showcases Indigenous Arctic sports that incorporate survival skills necessary to inhabit the extreme Arctic environment. Ben Kreimer speaks with filmmaker Jonathon Stanton. He is the producer, writer and directer of the new documentary, Games of the North: Playing for Survival. The film showcases traditional Indigenous sports of the Arctic from the perspective of the athletes themselves. The sports incorporate physical and mental skills necessary to survive in the extreme Arctic environment. 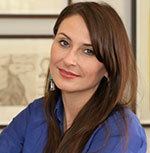 Sande Zeig is the producer and director of the new documentary Apache 8. The film unveils the unique and untold history of Apache 8, an all-women wildland firefighting crew from the Fort Apache Indian Reservation in Arizona. Throughout the documentary, the lives of four Apache 8 crew members are woven into the film's narrative, revealing captivating stories from their lives both on and off the fire line. The Silence, a new documentary by Tom Curran, tells the decades old, untold story of what happened behind church doors in the remote Alaska village of St. Michael. Throughout the 1970s, Father George Endall and his deacon-in-training Joseph Lundowski molested much of the Yup’ik children living in St. Michael, a village on the remote southwest coast of Alaska. In the decades following the abuses, the Catholic Church denied the accusations of molestation from St. Michael, and other Native villages throughout Alaska. In The Silence, four victims, now-grown up, tell their stories from childhood, revealing the events that ravaged their lives and their families. Standing Bear’s Footsteps, the new historical documentary by Christine Lesiak and Princella Parker (Omaha), tells the story of one of America’s original civil rights activists, Ponca Chief Standing Bear. “The film... is about what it means to be a person as told through the life of a Ponca Indian chief, and his struggle to be free,” said Lesiak. It is the first documentary to tell the story of Standing Bear’s life and activism work for Native American rights in America. The film presents his story though historical reenactments, photographs, film footage and interviews. Devin Whirlwindsoldier is Lakota and Diné. He was raised on the Rosebud Reservation in South Dakota. He grew up singing with various drum groups on the pow wow trail. Devin was able to stay positive and out of trouble through singing. He united with Stephen Yellowhawk and the duo formed “Buddaz and Stephen” and recorded their first album titled “Northern Lights.” Devin and Stephen also have recorded another project with RSBK (Ricky, Stephen, Buddaz & Kilo) titled RSBK. Reporter Nancy Kelsey recently spoke with Tracy Rector, Executive Director and Co-founder of Longhouse Media, about her new documentary March Point. The two also discussed Tracy's work with Native youth and how she empowers them through media literacy and training. March Point will be airing on many public television stations November 18th at 10pm eastern. Here is the interview, from October 2008. Interactive Media Specialist Eric Martin speaks with Raven Chacon (Navajo) an experimental musician, composer and educator. Raven has been building his own instruments for creating new sounds since he was a child growing up in Chinle. Today he teaches Native youth through various programs including the Native American Composers Apprenticeship Project. Crying Earth Rise Up is a film by Suree Towfighnia of Prairie Dust Films with consulting producer Debra White Plume (Oglala). The name of the film comes from an old belief of the Lakota that Mother Earth needs to be cared for through good stewardship of the land, caring for its natural resources. 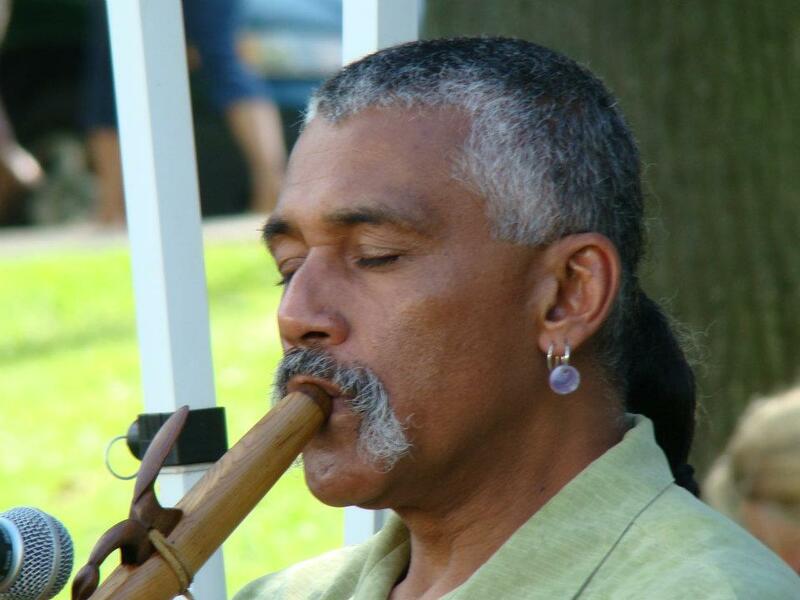 Executive Director Shirley Sneve speaks with Brent Michael Davids (Stockbridge Munsee Band of the Mohican Nation), a classically trained musician and composer. Brent Michael Davids (Stockbridge Munsee Band of the Mohican Nation) is a classically trained musician and composer. He has been a long-time fixture in the music scene of the Twin Cities area of Minnesota, but is now building a new home and studio on his reservation in Wisconsin. Through the American Composers Forum (ACF), he's a founder of the First Nations Composer Initiative (FNCI). Production Assistant Landon Mattison speaks with Swil Kanim (Lummi Nation), an award-winning, world-class virtuoso violinist and inspirational speaker. Swil Kanim (Lummi Nation) is an award-winning, world-class virtuoso violinist and inspirational speaker. from the Lummi Tribe in Washington. He travels throughout the United States, inspiring audiences through his music and personal stories. His compositions incorporate classical influences and reflect his journey from depression and despair to spiritual and emotional freedom. He is also the president of HonorWorks, a nonprofit organization who mission is to to create and ignite the potential for honor among all people. Southern Cheyenne and Arapaho filmmaker Chris Eyre is synonymous with Native film. His work includes feature films like Skins and Smoke Signals. He recently directed the film Hide Away featuring Josh Lucas and James Cromwell. Today, Chris shares his experience with his students as the Chair of The Film School at the Santa Fe University of Art and Design. Chris also serves as the host of the upcoming Vision Maker Media production, Growing Native. Growing Native follows Chris on his journeys through Indian Country, highlighting inspiring stories of cultural and physical sustainability. Associate Producer Blue Tarpalechee sat down with Chris after they had just wrapped filming for an upcoming Growing Native episode in Alaska. Production Assistant Landon Mattison speaks with Jack Gladstone (Blackfeet), a storysmith sharing his unique brand of music inspired by the stories and history of Native Americans. Production Assistant Landon Mattison speaks with Jack Gladstone (Blackfeet), a storysmith sharing his unique brand of music inspired by the stories and history of Native Americans. Jack recently was honored with the CM Russel Heritage Award, and a Native American Music Award. 2013 marks the 29th year Jack has been sharing insight about Montana's Indigenous people at Glacier National Park. Production Assistant Landon Mattison speaks with Hawk Henries.Hawk Henries is a gifted flutist and flute maker from the Nipmuc tribe in southern New England. He has performed at various venues across the United States, as well as several in the United Kingdom. Hawk has been a flute maker for over 20 years, and believes in creating his instruments through traditional techniques and the use of hand tools. Indian 101 is a new biopic from Comanche filmmaker Julianna Brannum. The film chronicles the life of LaDonna Harris and the role that she has played in Native and mainstream American history. In March of 2013, Vision Maker Media's Interactive Media Specialist, Eric Martin, caught up with Juliana at the South by Southwest Film and Interactive Festival in Austin, Texas and spoke to her about the documentary and her career. The efforts of one dying woman to preserve her Native culture don't end when she passes, but prompts a renewal in finding pride in that culture. She confronts the violent event over two centuries ago that began the destruction of her people and the shame that colonialism created. Vision Maker Media Assistant Director George Lee speaks with filmmakers behind the documentary Finding Refuage, Torsten Kjellstrand and Jamie Francis. Randall Warren Heavilin (Navajo) is a classically trained cellist and composer from Austin, Texas. A graduate of The Berklee College of Music, Heavilin: composes, performs, and produces a variety of music for films and other media outlets. Recently, Randall has composed the score for Yellow Fever, a documentary film that follows the Uranium boom on Navajo lands, and the effects that it has had on the people living there. Rising Voices is an upcoming documentary film by Wil Meya of The Language Conservancy and by Florentine Films Hot Productions. The Language Conservancy is a nonprofit organization that spreads information to the public about the crisis of endangered languages in effort to gain more support for Indigenous languages. They also work with Natives across the U.S. on language revitalization issues. The idea for Rising Voices started three years ago after noticing the great efforts put forth to revitalize the Lakota language by young people and The Language Conservancy. Some of the projects of the program include summer institutes and creating media projects, such as The Berenstain Bears in the Lakota language. Multimedia Intern Bekka Schlichting speaks with Elizabeth Weatherford, Director of the Film and Video Center at the Smithsonian National Museum of the American Indian. In 1979, Elizabeth Weatherford organized the first Native American Film and Video Festival for the Museum of the American Indian, which became the Smithsonian's National Museum of the American Indian (NMAI) in 1989. The Festival was held at the Smithsonian's location and host sites in New York until 2011. She was also a co-founder of the Native Cinema Showcase, which is held annually during Indian Market in Santa Fe, New Mexico. The 13th Native Cinema Showcase will be held August 12, 2013, to August 18, 2013, at the New Mexico History Museum. It is presented by NMAI and the Southwestern Association for Indian Arts (SWAIA), coordinated by NMAI's Melissa Bisagni with the staff of SWAIA. The featured videos and films are produced by and about Indigenous peoples. A native of Plano, Texas, Willow Blythe (Muscogee-Creek) is a freelance multimedia creator for K.E.R.A. public media in Dallas, Texas. A member of the Muscogee-Creek Tribe, Willow attended Southern Methodist University where she recently received her degree in Journalism. In addition to her freelance work, Willow is the head of her own blog, found on her website, which generally focuses on gaming. However, she also has interests in gaming, fashion, art, and photography. She serves as a tutor for students- assisting them with organizational, writing, and homework skills. During the summer of 2013, Willow served as a multimedia intern at K.E.R.A. with support from Vision Maker Media. While there, she created various media pieces for the station that can be found on www.KERA.org. Gyasi Ross is of both the Blackfeet nation and the Suquamish nation, and currently lives on the Port Madison Indian Reservation. He is a father, lawyer, filmmaker and author. For many people living on the reservation Ross is the only lawyer they know, he said, and so he gives legal advice as best he can. Above his various vocations, Ross is most passionate about being a father to his son. Ross also gives lectures where he speaks about the importance of mentorship for the youth of today, and with the help of a couple grants, he got his start in filmmaking through making YouTube videos. Ross is a contributing writer for the Huffington Post and Indian Country Today. He has also authored two books: the first, Don’t Know Much About Indians (But I Wrote a Book About Them Anyways) and the second, How to Say I Love You in Indian. Both are compilations of short stories, poems and essays. Interviews were conducted by Georgiana Lee and edited by Jessica Gibbs. Eastman is a prominent figure in Native American history for his contribution in the medical field as a Native physician, particularly after the Wounded Knee Massacre. He is also remembered as an accomplished author and cultural leader of his time. Kate is a new mother and a PhD candidate in American studies at Dartmouth College. Her fellowship there brings the family story full circle, as Eastman himself attended Dartmouth College. Both relatives endured similar trials and sacrifices to make their education possible. Before Syd began filmmaking, he garnered a lengthy and vibrant career in city planning and organizing, and has held board positions for numerous organizations across the U.S., including Vision Maker Media. Ohiyesa: The Soul of an Indian, will be an hour-length Public Television documentary. Listen in as project coordinator Blue Tarpalechee shares his experiences at Vision Maker Media in an interview with our assistant director Shirley Sneve. Vision Maker Media Assistant Director George Lee (Navajo) speaks with filmmakers Ramona Emerson and Kelly Byars about their upcoming film Mayor of Shiprock. From Tohatchi, New Mexico, on the Navajo Reservation, Ramona Emerson (Diné) is a filmmaker who received her degree in Media Arts from the University of New Mexico in 1997 and has worked as a professional videographer, writer, and editor. Over her thirteen-year career, Emerson has received support from the State of New Mexico, National Geographic, Sundance Institute, and the Ford Foundation. 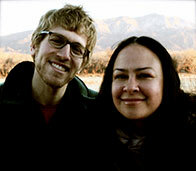 She and her husband, producer/actor/artist Kelly Byars (Choctaw/Chickasaw) continue to produce films through their company Reel Indian Pictures in Albuquerque, New Mexico. The duo met in 1985 when Emerson, at 11-years-old, sat in the audience of a talent show Byars had entered. With two great steps, Byars, then a classical ballet dancer, leapt over a standing woman by doing the splits midair. This marked the first time Emerson saw him. Nine years later the two met once more, but this time Emerson “lassoed him,” and they produced their first movie together by 1997. Emerson and Byars are in production with the Vision Maker Media-supported film The Mayor of Shiprock, a documentary film for Public Television. They applied to the Vision Maker Media Public Media Content Fund in 2012 and were awarded production funding. The idea for the documentary came when Emerson met then 18-year-old Graham Beyale on a movie set. Emerson heard word that Beyale was starting a community service movement among the young people in Shiprock. After inquiring from Beyale himself, who told her about the various events he had hosted, Emerson and Byars discussed the possibility of making his story a documentary. Ultimately they decided filming Beyale and the young people helping him would be a great thing. The film follows the lives of the group of young adults and how their love of each other, of their families, and of their community have made real change in a Native community. Ranging in age from 16 years to 26 years, the group of 40-50 members is made up of Navajo and non-Navajo community members. Their mission is to make noticeable change to inspire change in their community. The Northern Diné Youth Committee (NDYC) came to be over three years ago and was founded by a young Navajo man, Graham Beyale. Beyale, with help from his sister, began to realize that the only way to make change in their community was to make changes themselves and hope that others begin to become part of the process. Home after his first year of college, Beyale noticed the need to make change. Beginning with a small drive-in movie for kids in Nizhoni Park, the community began to come together. This led to more events and activities almost entirely created and carried out by Beyale, his family, and a few friends. Beyale’s family, overloaded with most of the financial and participatory responsibilities finally advised Graham that it was time to make the community a part of this effort. The changes have a lot of support in the community. Even Shiprock’s Chapter President was impressed and inspired by the efforts of the youth in his community as he discussed the fact that the NDYC had inspired similar grass roots efforts around the Navajo Nation and expressed his wishes for a longer sustained effort around the Navajo Nation. The NDYC continue to develop ideas, utilize tools, and seek inspiration to bring back to their community and implement. Look for the The Mayor of Shiprock on PBS in fall 2014. The 1491s are a comedic group that travels the nation telling Native stories and bringing various social issues to light. They describe themselves as a “gaggle of Indians chock full of cynicism and splashed with a good dose of indigenous satire.” The 1491s got their start when the father of Dallas Goldtooth married the mother of Migizi Pensoneau. Growing up, the two boys made videos for fun. Eventually, the three other members asked to join in. Their mission is simply to make themselves and their audience laugh, and to encourage critical discussion about some social norms within the Native community.